Listed below are a few of the world’s finest crystal manufacturers. Some you may be familiar with some of these, and some may be new to you. We ask that you keep an open mind…the crystal piece of your dreams could be a blog post away! This opulent crystal manufacturer originated in Baccarat, France in 1765. To this day, Baccarat continues to produce crystal in this region of France. You may already be familiar with their popular Massena and Harmonie patterns. Baccarat originally began with the relatively pedestrian production of glass window panes. This company has a stemware replacement program, which affords customers the opportunity to purchase stemware pieces that have been discontinued. However, production of discontinued pieces can take months, and costs are quoted on a need-to-know basis. 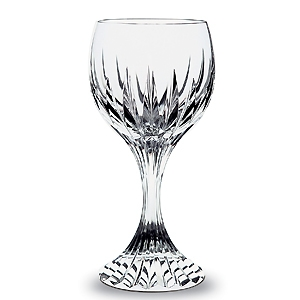 New Baccarat stemware prices start at $100. In the world of crystal production, Heritage is considered a new kid on the block, with its founding in 1990. 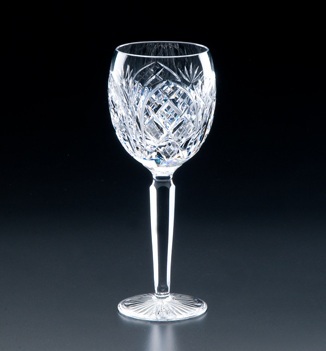 Heritage crystal is manufactured in Waterford, Ireland by a former glass blower from the Waterford crystal company. The company takes pride in its use of centuries old mouth-blown and hand-cut techniques, for which not all companies can still take credit. Heritage crystal is more intricately hand-cut than some of the other manufacturers; thus their pieces give off a brilliance that is second to none. 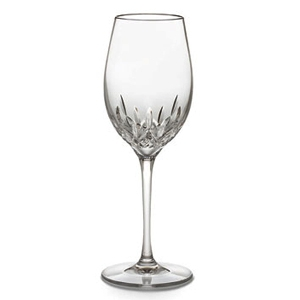 Heritage’s Cathedral stemware pattern ranges from $120-$195. 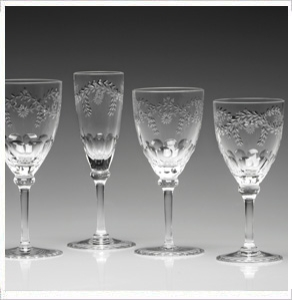 Waterford began producing crystal drinking goblets and beautiful items for the home in 1783 in Waterford, Ireland. Over 200 years later, Waterford is still producing some of the world’s finest crystal stemware and household items. The company’s humble, initial visions have been transcended with the installment of patterns like Araglin, Lismore Essence, and Carina. In fact, the original Lismore pattern is the best selling pattern in the world nearly every year. A few of the company’s patterns are listed as dishwasher safe. Today, Waterford is known as a staple crystal manufacturer producing crystal items from $55 and up. William Yeoward manufactures crystal that is steeped in antiquity, yet modern in terms of functionality. If you have an affinity for vintage or antique crystal patterns, this crystal is for you! Most of the company’s crystal pieces are derivations of antique patterns that inspired its namesake. William Yeoward’s designs are unique because they are hand-engraved by a skilled artisan, not simply cut. Although aesthetically pleasing, beauty such as this does come at a price. Most stemware patterns range from $90-$300. Now that you have educated yourself on the world’s finest crystal manufacturers, it’s time for you to decide which style is most suitable for you. If you are not quite ready to take the plunge, you can always visit the nearest specialty shop to see and compare the beauty and craftsmanship of these fine crystal manufacturers. Molly Mulvaney is a sales associate at Bering’s Hardware in Houston, TX. Bering’s is well known for a broad range of carefully selected home goods such as housekeeping products to grilling products and accessories, as well as fine crystal stemware. Molly enjoys spending time with her family and friends, attending graduate school, doing Crossfit, being outside, watching movies, and eating sweets. Next ArticleDisplay Your Inspiration: Our New Window Display by Connie Post!